If you don’t know how to make money from matched betting then you are missing out on an easy way to earn extra income online. Put aside your views on gambling, matched betting is a simple strategy that allows you to take advantage of bookmaker offers and make a profit. It is totally legitimate and to top it all, the money you make is tax free. Bookmakers give away huge amounts of money to attract new customers and to keep their existing customers betting. Bookmakers give away huge amounts of money to attract new customers and to keep their existing customers betting. Watch any big sports event on TV and you’ll see bookmakers offering free bets to sign up for an account or advertising special offers with the promise of a free bet if you lose. The way to make a profit is by using bookmakers and betting exchanges to bet on both outcomes of an event (win and lose). Using a clever formula to work out the stakes, all possible outcomes are covered and you will make a profit from every free bet, as long as you follow the simple steps. We’ve been in the betting business for over 30 years and have been exploiting free bets for around half that time. Obviously it’s been easy money with our expert knowledge of betting and odds but with a little know how and some handy tools, anyone can do it. Here at Matched Bets we provide you with everything you need to earn extra money. Our members get access to over £1000 worth of sign up bonuses with step by step instructions explaining how to convert the offer into tax free cash. Specialist software will match bets to save valuable time and help maximise the profit potential of each offer. More money can be made by taking advantage of reload bonuses and daily free bet offers. Matched Bets saves the leg work of trawling bookmaker sites every day by delivering these offers through daily updates along with details explaining how to turn every offer into profit. How much extra income can I earn from matched betting? Among the easy money claims being made, you’ll notice some people boasting they earn £2000 a month match betting. Some of these claims are false (it’s just the nature of some people to make stuff up) but in other cases these claims can be true. It simply depends upon how much time you want to invest but £2000 per month will be the upper limit at the moment and it’s not easily achieved. £500 per month is a much more achievable target and can be earned by working an average of 20-30 minutes per day once you are confident and have a bankroll big enough to fully exploit the offers. By starting out with sign up offers, you can begin building a bank from as little as £50 starting budget. That outlay will be fully recouped as you should make around £50 profit with the first three offers. By working through sign up offers in a strategic way, your bank will grow into hundreds within a week or two at the outside. Again, your income depends on how much time you want to devote to match betting and also how much profit you retain as working capital. Another great thing about match betting is the freedom it gives to spend your profits whenever and on whatever you like. It’s a justifiable question to ask of any easy money making scheme and especially one that’s offering realistic earnings of up to £50 per hour. The simple answer is no, it’s not a scam and once you understand what is involved you’ll see it is 100% legitimate. Matched betting has been featured by the likes of The Telegraph, The Guardian, The Huffington Post, Money Saving Expert and many other reliable sources of news and information. Try it yourself with our 14 day trial for just £1!Join Now! In the Telegraph article, William Hill spokesman Graham Sharpe states categorically that there is no illegal element to free bets and people can do what they like with them. Winnings from betting are not taxable as the government takes its revenues from bookmaker profits and from the commission charges on betting exchanges. By paying for a service like Matched Bets, you are provided with the tools and information that allow you to make money quickly. Without the software and access to offers it would take so long to find the offers and match up odds that it would not be a viable investment of time, especially for reload offers. Many people would be better off finding a part time job on minimum wage. A William Hill spokesman confirms there are no rules against matched betting. There’s a free trial offer which will more than pay for the first couple of months membership and anyone who finds matched betting is not for them can move on and will still be in profit. In addition, we’re so confident that members will be satisfied with our service they are guaranteed their money back any time within the first 30 days. The universal popularity of gambling means online betting is a very profitable business and the competition to attract new customers is fierce. Bookmakers have large marketing budgets and have found one of the best ways to get people to try their betting websites is by giving free bets and bonuses as an incentive. It has proved so successful that free bets are being used a means to retain customers too. Our research has shown a big increase in the number ‘money back’ offers over the last few years, these offers give existing customers free bets as consolation for backing a loser. Along with no deposit offers, free casino spins and free bingo play, there are many ways our members can exploit offers to generate regular income. Bookmakers understand that many people will take up the welcome offer and may never have another bet. Even enthusiastic punters will probably revert back to one bookmaker simply out of convenience or habit. Any losses from free bet offers are absorbed by the profits from the customers who decide to stay with that bookmaker for their regular bets. However, bookmakers do not like bonus abuse. They have some very sophisticated software to identify bonus abuse in addition to customers seeking to profit by unfair advantage. Matched bettors need to consider their betting patterns so as not be flagged by these systems as it could lead to exclusion from free bet offers or even their account being closed. It’s one of the reasons we advise occasionally placing ‘mug bets’ (more on that later) and Matched Bets members are given plenty of advice about how to protect their most valuable betting accounts. Try it yourself with our 14-day trial for just £1!Join Now! 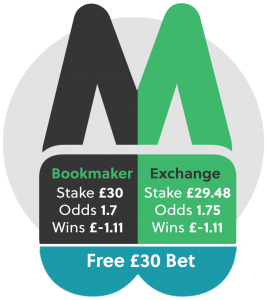 Matched Betting: Is it really risk free? Yes, you can match bets in such a way to guarantee a profit from free bets. The only risk being you make a mistake but we are here to help you get out of such a predicament with minimal loss and there are so many money making opportunities that any losses are quickly recovered.Most offers require you place a bet with your own money in order to receive a free bet. In such cases, you’ll place a qualifying bet and accept a small loss in order to receive the free bet. For example, it might cost 50p to secure a £25 free bet from William Hill but you can easily make £17 profit from the £25 free bet. To understand how you lose so little to secure the free bet we should explain more about matched bets. Matched betting is a two-part process that involves placing a back bet with a bookmaker and a lay bet on a betting exchange on the same selection. This means you will get a return if the selection wins or loses. A ‘back’ bet and ‘backing’ are terms given to placing a bet on something to happen. For instance, backing a horse to win a race or a football team to win its match. A ‘lay’ bet and ‘laying’ are terms given to betting against something to happen. For instance, you could lay a horse to lose its race or lay a football team to lose its match. You will use betting exchanges for lay bets. If the lay bet is successful, ie the horse loses the race, you’ll win the lay stake. If the lay bet is unsuccessful, ie the horse wins the race, you’ll lose the lay stake multiplied by the odds you offered. The back and lay bets will cancel each other out if you match bets at the same odds. In practice, you’ll find close matches and with commission charges, take a small loss on the transaction. The profits are made by using the free bet. Because you don’t have to pay for the back bet, you can work out a lay stake that returns a profit whatever the outcome of the bet. You should try one of our free trial offers now and discover for yourself how easy it is to make money from free bets. The step by step guide explains everything from opening accounts with the bookmaker and betting exchange, finding odds, placing back and lay bets for the qualifying bet and the staking plan to extract the profit from the free bet. You’ll be delighted to learn that making a profit from sign up offers is a simple four-step process. Open an account – you’ll open accounts with a bookmaker and betting exchange when you first start out. Try it yourself with our 14-day trial for just £1Join Now! There are various conditions to sign up offers such as the free ‘matched bet’ offered by William Hill, the first bet risk-free and deposit bonuses with wagering requirements. We’ve dissected the terms and come up with the best way to make a profit for each sign up offer and give step by step guides for each one. There are some sign up offers that we don’t feature because there is a chance we could lose and we are not here to gamble. We provide our members with a comprehensive list of sign up offers from bookmakers accepting UK customers. The offers are presented in such a way that beginners starting out with no betting knowledge and a low budget can build a bank progressively while gaining confidence before tackling some of the more complex offers which require more money to extract the full profit potential. Some people may have already have opened accounts with one or two bookmakers but with over £1000 of free bets available, there are lots of opportunities to earn money quickly. Depending on how much time you want to dedicate to match betting, there’s no reason why you can’t make £600-£700 profit in the first week or two. Once you’ve exhausted the sign up offers, you can turn your attention to reload offers and the near endless money making opportunities they present. Sign up offers make a quick profit but because they are a once-only deal, they will not keep your season ticket renewed or pay for your holiday year after year. Reload offers are free bets and bonuses made available to existing customers with the intention of encouraging them to continue to bet with the bookmaker. These offers are manna from heaven for matched bettors and the reason you will be able to use matched betting as a means of making regular extra income. Reloads can be loyalty based offers or more commonly ‘money back’ offers. We check for the latest offers to ensure our members have access to every available avenue to earn some extra cash from online bookmakers. And, we’ll explain how to turn each one into a profit with a step by step guide. You may be provided with exclusive offers if you opt into the bookmaker promotions during registration. We’re here to help you with those offers too, just get in touch and we’ll explain how to turn those offers into cash profit. If you have the time and want to push your profits nearer to the £2000 per month mark, we’ll show you how to make the most of ‘advantage’ offers. This type of offer is not strictly risk-free, but we explain how to load the odds so far in your favour that all you need to do is keep going to hit the big wins. We keep saying that it’s easy to make money with matched betting but it’s also true to say that you’ll need the right tools to make it worth your time. The Odds Matcher and calculator are key to making matched betting accessible to those who don’t understand odds and aren’t too good at working out the arithmetic for a profitable staking plan. It’s safe to say, these tools automate the process leaving you to place the advised bets with bookmaker and exchange before sitting back and waiting for the profits to roll in. Having access to a comprehensive list of offers saves a huge amount of time too. But where Matched Bets comes into its own is with exclusive Bet Tracking tools and unique Acca Backer that will free up even more of your time, creating more opportunities to increase your income. One of the tasks that comes with matched betting is managing your betting accounts. You’ll have lots of accounts with different bookmakers, you’ll need to know when your free bet will be available, as unfortunately they are not always provided instantly. You’ll want to know which accounts have bets pending and which have credit balances, when withdrawal requests have been made and when they hit your bank account. To take it seriously, you’ll want to know your profit and loss so you too can confirm how much extra income you’ve made matched betting. Our members have exclusive access to Bet Tracker, an online account management tool which provides an overview of all your betting accounts saving the need to start learning how to create spreadsheets or fill in a rough-edged template that someone has put together and shared on the internet. We also provide an easy to use calculator to make money from accumulators. Again, this superb web-based application does away with the need for spreadsheets. This tool will be a revelation to matched bettors who up to now are tied to their computers all day at weekends in order to cash in on those great Acca Insurance offers. The mobile friendly application will allow you to keep track of your acca and place bets anywhere you have a good signal or access to wi-fi. Hello, my name is Panos Papadakis and i am very interested to start doing matched betting with the Matched Bets system! From what i understand matched betting in general is mostly around UK and a lot of bookmakers does not allow from people outside of UK to use their free bet offers. This is the reason i decide to send this email, because i would like to ask if you offer support to people outside of UK like me (i live in Greece). I am also in a process of research to find a good sponsor to help me start and ideally i would like to find a good sponsor from Greece to guide me correctly because he should know how people from Greece can do Matched Betting. Unfortunately so far i did not manage to find anyone and i know it is not very common from people to send emails and asking to introduce a sponsor but i thought that maybe you could suggest me an experience member of Matched Bets from Greece or maybe someone who knows how people from Greece can do matched betting. If you could introduce me to someone it would be great! The advice we provide is for people in the UK who can legally bet with bookmakers licensed by the UK Gambling Commission. My understanding is Greece is attempting to introduce an online gambling licence regime which may lead to operators offering incentives suitable for matched betting at some point in the future. However, this is uncertain and dependent on unknown licensing and business model variables.